It’s a bright, breezy day at the seaplane base in Lakeland, Florida, the second day of the 2013 annual Sun ’n Fun International Fly-In and Expo. The winds are a little strong—gusting to 20 mph—but the crowds are gathering for the events. There will be grapefruit bomb drops from the aircraft, and spot landing and takeoff contests. The hot dogs and hamburgers are grilling and the charcoal scent wafts over the crowd of about 200. With lemonades in hand, spectators mill around the aircraft, and the announcer starts up his spiel, describing incoming seaplanes and what the day has in store. It’s bucolic, charming, and quiet except for the occasional roar of a seaplane taxiing off the field or taking off on the water—a lovely day to be watching airplanes by the shore. But over on the display line, one man is sweaty and all worked up. He is climbing like a monkey over a massive AirCam on floats. He’s rigging camera equipment, trying to attach microphones and miniature cameras. He’s in the seat, on the rigging, hanging over the props. All around him are black-shirted people scurrying to do his bidding. 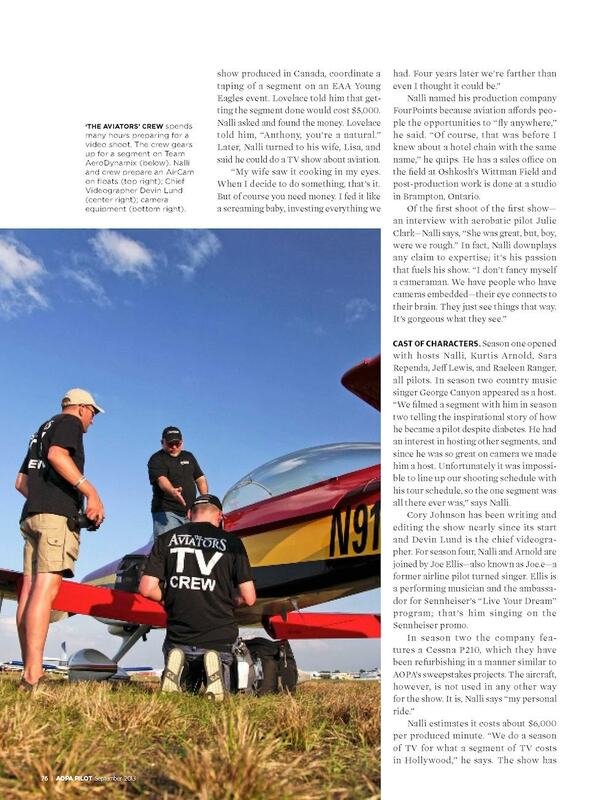 Those black shirts are emblazoned with “The Aviators” and this whirling dervish of a man is Anthony Nalli, executive producer and director of his brainchild television series about aviation. 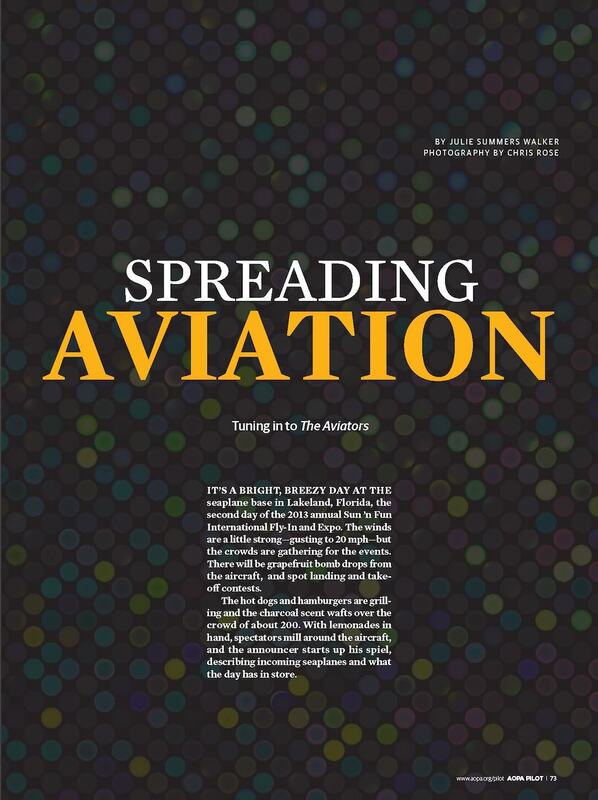 Now entering its fourth season, The Aviators has quietly but firmly gained a footing in the world of public broadcast TV. It claims more than 10 million viewers in the United States alone, and has fans worldwide. It’s not the type of program you can turn your TV to at 8 p.m. on a Wednesday. Like most public television series, it’s broadcast at the discretion of local PBS stations. But you can download it on iTunes and Amazon and through a Hulu subscription—and Nalli and crew actively promote the show. Nalli helped John Lovelace of Wings Over Canada, the documentary television show produced in Canada, coordinate a taping of a segment on an EAA Young Eagles event. Lovelace told him that getting the segment done would cost $5,000. Nalli asked and found the money. Lovelace told him, “Anthony, you’re a natural.” Later, Nalli turned to his wife, Lisa, and said he could do a TV show about aviation. Nalli named his production company FourPoints because aviation affords people the opportunities to “fly anywhere,” he said. “Of course, that was before I knew about a hotel chain with the same name,” he quips. He has a sales office on the field at Oshkosh’s Wittman Field and post-production work is done at a studio in Brampton, Ontario. Season one opened with hosts Nalli, Kurtis Arnold, Sara Rependa, Jeff Lewis, and Raeleen Ranger, all pilots. In season two country music singer George Canyon appeared as a host. 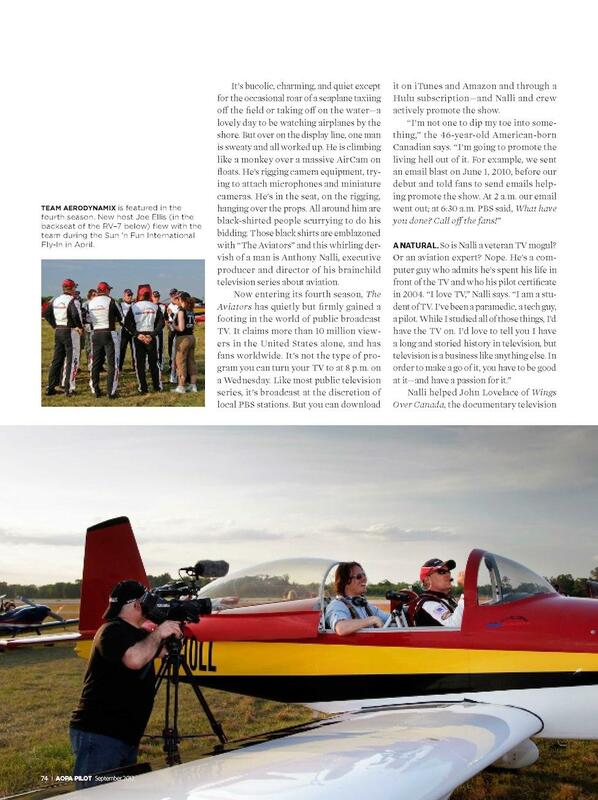 “We filmed a segment with him in season two telling the inspirational story of how he became a pilot despite diabetes. He had an interest in hosting other segments, and since he was so great on camera we made him a host. Unfortunately it was impossible to line up our shooting schedule with his tour schedule, so the one segment was all there ever was,” says Nalli. 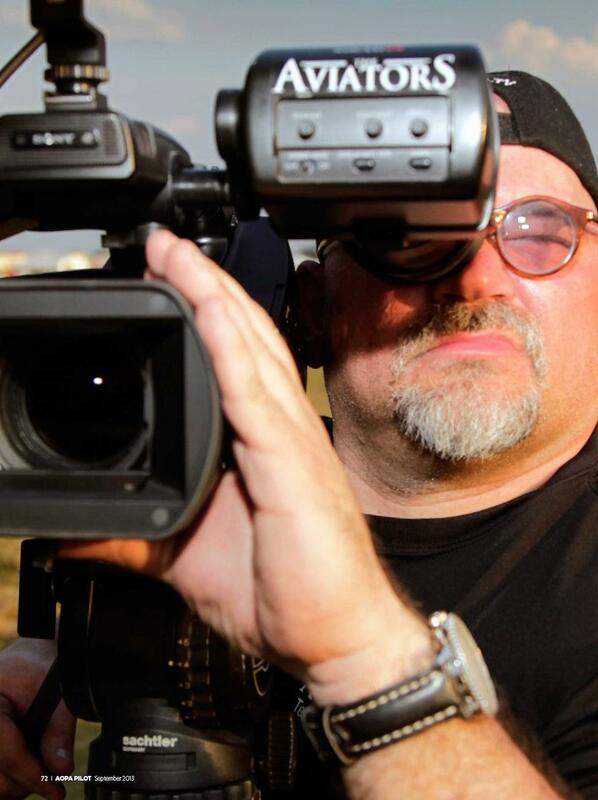 Cory Johnson has been writing and editing the show nearly since its start and Devin Lund is the chief videographer. For season four, Nalli and Arnold are joined by Joe Ellis—also known as Joe.e—a former airline pilot turned singer. Ellis is a performing musician and the ambassador for Sennheiser’s “Live Your Dream” program; that’s him singing on the Sennheiser promo. Nalli estimates it costs about $6,000 per produced minute. “We do a season of TV for what a segment of TV costs in Hollywood,” he says. 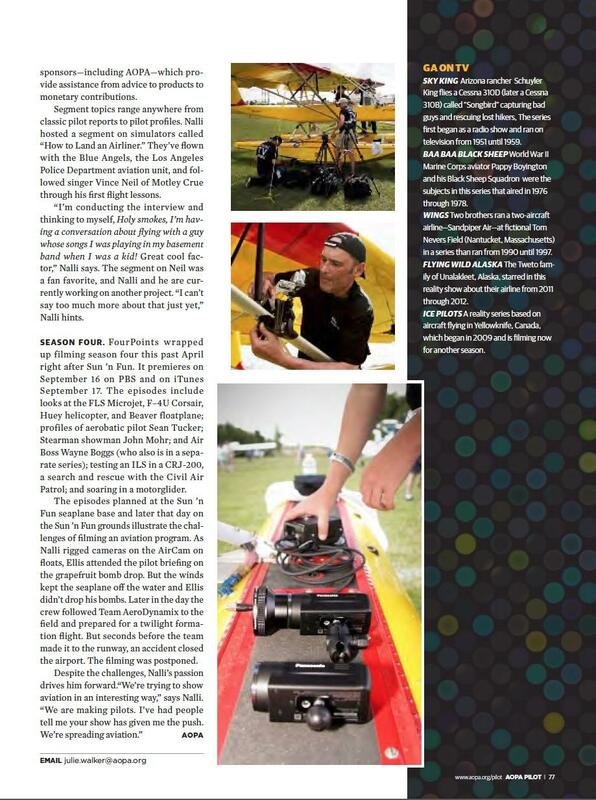 The show has sponsors—including AOPA—which provide assistance from advice to products to monetary contributions. Segment topics range anywhere from classic pilot reports to pilot profiles. Nalli hosted a segment on simulators called “How to Land an Airliner.” They’ve flown with the Blue Angels, the Los Angeles Police Department aviation unit, and followed singer Vince Neil of Motley Crue through his first flight lessons. “I’m conducting the interview and thinking to myself, Holy smokes, I’m having a conversation about flying with a guy whose songs I was playing in my basement band when I was a kid! Great cool factor,” Nalli says. The segment on Neil was a fan favorite, and Nalli and he are currently working on another project. “I can’t say too much more about that just yet,” Nalli hints. FourPoints wrapped up filming season four this past April right after Sun ’n Fun. It premieres on September 16 on PBS and on iTunes September 17. 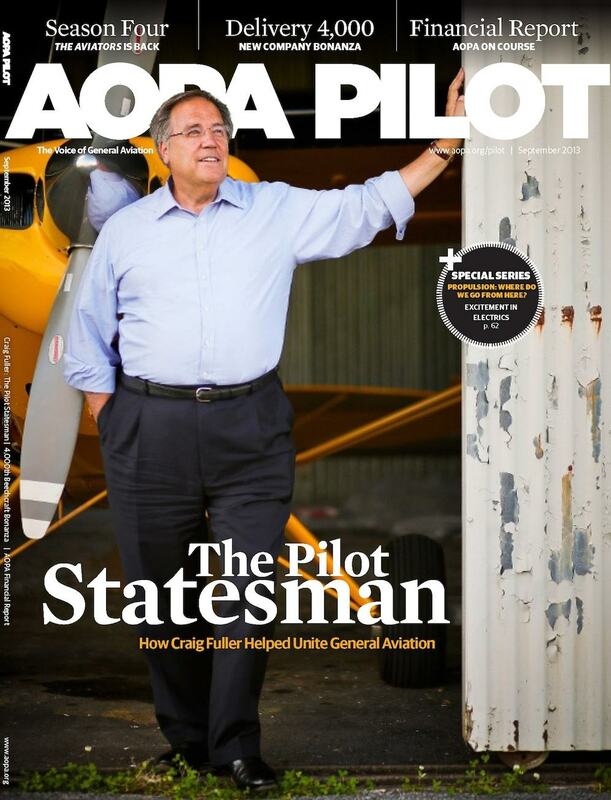 The episodes include looks at the FLS Microjet, F–4U Corsair, Huey helicopter, and Beaver floatplane; profiles of aerobatic pilot Sean Tucker; Stearman showman John Mohr; and Air Boss Wayne Boggs (who also is in a separate series); testing an ILS in a CRJ-200, a search and rescue with the Civil Air Patrol; and soaring in a motorglider. The episodes planned at the Sun ’n Fun seaplane base and later that day on the Sun ’n Fun grounds illustrate the challenges of filming an aviation program. As Nalli rigged cameras on the AirCam on floats, Ellis attended the pilot briefing on the grapefruit bomb drop. But the winds kept the seaplane off the water and Ellis didn’t drop his bombs. Later in the day the crew followed Team AeroDynamix to the field and prepared for a twilight formation flight. But seconds before the team made it to the runway, an accident closed the airport. The filming was postponed.